I’ve been reading Bruce Ossman’s book: Violin Making: A Guide for the Amateur . This is an excellent book showing with clear diagrams every stage of violin construction. My only minor criticism is the mix of metric and imperial measurements – thicknesses are in 1/32″ while lengths are in centimetres – but the clear diagrams throughout are very self explanatory. 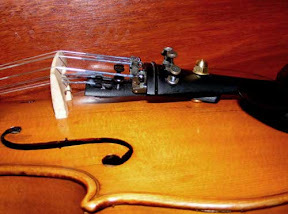 From this I have adapted the techniques of traditional violin making to design and begin construction of a pochette – a kind of travel fiddle popular in the eighteenth century by itinerant dancing masters. On 18 January each year since the 2003 bushfires that devastated Canberra, we photograph our garden as a measure of our garden’s recovery since the bushfires took it back to scorched earth. It is a time to reflect on our own lives and on what is important to us since confronting the fires head-on and realising that all that we had could have been snatched away in an afternoon. We were fortunate and escaped with minor damage to the house and no injuries. Our house was only three houses back from the main fire front as it crossed into Holder and Duffy. And even five years on the house next door still bears damage from that day. One of the biggest challenges in establishing a garden from bare earth in Canberra has been the five-year drought that has left us with annual water restrictions. We recycle gray water from the washing machine and air conditioner and focus on a few plants at a time to establish them – and hope for the best. We learned a great deal about ourselves that day in 2003 – how we can depend on each other, how we stand up to a crisis, and how in the face of immediate threat we focus on our immediate needs and the range of our own effort – and that in a major disaster, those services we depend on in an emergency are quickly overwhelmed and we stand or fall by our own efforts and our wits. We learned too about community and how in times of difficulty the local community works together. Those friendships formed in adversity remain solid five years on. That tree pictured in the scorched image above is now our dining table – a lasting marker of a day that changed the lives of many Canberra residents – a day that helped us to appreciate what we have in life. 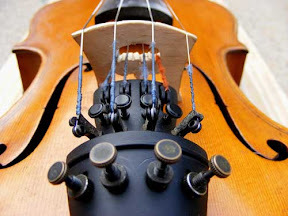 Yes, it’s been the bane of my Hardanger fiddle (hardingfele) – the lack of fine tuners for the sympathetic strings. Today all that is changed! When I made the new bridge and reshaped the nut I did try hooking a one-quarter size tailpiece over the main tail-piece to get eight fine tuners – string adjusters – but that placed the adjusters right up against the bridge – even with the tail-gut shortened. After some measurement, I figured that if I could push the under-tail-piece back by 1.5cm I could position the bridge in the correct place, and not have the string cotton windings sitting on the bridge. The answer lay in a 3/16″ bolt. I lined up the two tail-pieces in the vice and drilled through them both to achieve the right overhang. I then threaded a bolt up through the quarter size tail-piece, then placed a nut between the two tail-pieces to provide clearance for the upper fine-tuners to work, and then finished the top with a washer and nut. After re-assembly I can now state that the double-decker tail-pieces still clear the violin’s belly by a good margin and now allow for fine tuners on all eight strings! Some time ago My daughter acquired a banjo mandolin – an eight-string plucked/strummed instrument with the size and tuning of a mandolin – but with a small banjo-like skin for the sounding board. Although the frets were (unusually) in tune, the instrument was in poor shape with the wooden soundbox collapsing at either end resulting in an unplayable high action. The solution? To dismantle the instrument and relocate the neck and string courses at 90 degrees – where the body sides were still vertical. This entailed drilling some new holes for the neck attachment and relocation of the tail-piece, the addition of a button for a strap and a new set of strings. I also sanded down the frets a bit as they were sitting quite high off the fingerboard. And here is the result – a playable if rather strange instrument! Also known as a mandolin-banjo this hybrid instrument was invented around the mid 1890s and was popular in the 1920s in the heyday of mandolin orchestras. It has a big sound for a small instrument which made them popular in dance halls at a time when instruments were beginning to be amplified, and they would have been good for busking for that reason too. The eight strings are tuned in four courses (same-pitch pairs) using standard mandolin or violin tuning G-D-A-E from lowest to highest.